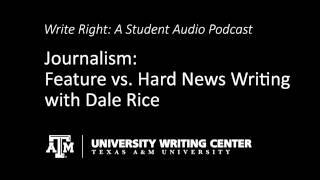 MEGHAN: Howdy and Welcome back to “Write Right,” Today we are talking with Dale Rice, Director of Journalism Studies here at Texas A&M, about the difference in hard news and feature news writing. What is feature writing and how is it different from hard news? DALE RICE: Well in general I’d say in journalism you can basically say that true stories fall into two categories. They fall into the hard news category, or they fall into the feature category. The hard news are those stories that are covering the events that are taking place out there. Feature stories are much more either playing off that or are fun, amusing, or life revealing kinds of stories. Good examples of feature kinds of writing: music, the arts, movies, food, entertainment of all kinds, fashion. These are all things that people have a great deal of interest in but may not be the most pressing issues of the day. And so you turn around and look for ways to write stories about those things that are interesting, fun, engaging. MEGHAN: Okay, well when you write a feature story don’t you go about it in a much different way? MEGHAN: Now, an intro for a feature story can be much different than a hard news story? DALE RICE: Yeah for the feature stories, you can get a lot more into anecdotal writing and descriptive writing and spend a lot more time setting the scene than you would do in a hard news story. So that’s a bit of the reason that you have so many different approaches that you can take in a feature story. You can really hone in on somebody’s appearance, somebody’s personality, the kinds of things that really wouldn’t come to play in a news story, right? I mean really how the person looks, or how the person acts, or what they’re personal situation is, seldom contributes to what’s happening in the news story, unless of course they’re a serial killer that’s caught and then you’d go after all of that sort of thing, or a victim. But, for the most part when you have people who are involved in government, for example, discussing the big issues of the day, what they’re wearing to the press conference is just not important. But in a feature story that whole appearance thing might in fact be the first three or four paragraphs of your story as you try and give every little detail about how somebody is appearing and acting during, for example, a news conference. So if you were writing a feature story about the same event you would take a very very different approach to it. MEGHAN: In hard news you are expected to grab the reader with a captivating lead and deliver the facts as quickly and clearly as possible. In a feature story you get the opportunity to use description and detail to entice your reader. Your interviews can be more in-depth and can focus on how people feel about an issue rather than just what happened. In Dale Rice’s Media Writing I and II students get the opportunity to practice writing both feature and hard news stories. In our next episode, Dale Rice will discuss ways to approach sensitive or difficult interviews. Thanks for listening to this episode or “Write Right,” we’ll see you next time.